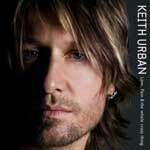 Keith Urban is one of those artists referred to in Nashville as a Triple Threat. Being a three-time Country Music Association winner for "Male Vocalist of the Year" is testament to his vocal ability. In the top selling country artists, Keith is one of the few who writes the majority of his own songs. By comparison, "King George" Strait has had a phenomenal career with 53 #1 hits thus far and never penned a single line. He is also praised as one of the most competent and electrifying musicians of his era by peers, critics, and fans alike. He started playing ukulele at the age of 3 because it was the only instrument small enough for his little hands and his mastery of multiple instruments grew as he did. Love, Pain, & the whole crazy thing is filled with soaring solos and layer upon layer of guitar. Keith also plays piano, ganjo, bass, and a host of other instruments on his latest offering. This statement is true of the album. While "Once in a Lifetime" has made history for highest chart debut on Billboard, it is not one of the strongest songs on the CD. With what could be called a "country disco" feel, it sets the predominantly positive vibe found throughout the CD. "Shine" is a mid-tempo testament to loyalty and love lasting through good and bad times. It's arranged well and gives Keith a chance to shine in his myriad of talents. "I Told You So" is the musical masterpiece of the CD. Ullian pipes clashing with Keith's trademark ganjo and furious drumming give this song a distinct sound that will set it apart on radio-country or pop. The vocals are perfect and show off his higher range. It is virtually impossible to listen to this song without playing "airdrums" on your steering wheel. Expect this one to peak at #1 and refuse to budge for at least a month. I was biased against "I Can't Stop Loving You" before I heard it. I think that a capable songwriter recording cover songs can be a waste. What do I know? Keith has made this old Billy Nichols penned song recorded by Leo Sayer and better known in the USA by Phil Collins into a perfect country song about heartbreak and sacrifice. The two minute guitar solo at the end brings to my mind a mellow Slash. "Won't Let You Down" is one of the weaker songs on the CD. The feel of the music doesn't quite match the positive lyrics. It's not even that this is a bad song, but that it is outshined by so many others in the collection. Had another artist recorded it, it could have been a highlight on a less stellar collection. This clever little number starts with a recording of the initial demo: Keith, a bass guitar, and a drum machine. Then it kicks into the polished studio version. "Faster Car" is driven by a funky bass line, cheeky lyrics, and a brass-dare I say it- horn section. I've had the privilege of hearing this one live and it does not disappoint. If the record label is brave enough to release it despite the novelty of the alternating quality between the first and second verses, it should be another blockbuster hit. You just have to keep the rhythm when you hear the infectious piece. This is another well-chosen cover, originally by Sarah Buxton. As done by Keith, the song becomes about a man singing to himself. Women who have been with a "Stupid Boy" will relate and men who have been a "Stupid Boy" will be reminded to hang their heads in shame. A guitar solo takes this one on and on, expressing a man's psyche through six strings. "Used to the Pain" may seem disconnected on first listen, but it's one of those songs that the more you hear, the more you appreciate. Like many of the other tracks, it seems more of a rock than country song, only showing that country is where you find today's melodic rock and roll that doesn't quite fit on pop radio rotation. It's another highlight in an album full of highlights. "Raise the Barn," featuring additional vocals by Ronnie Dunn, is a love letter from an Australian to the region of the USA that he has come to call home. Inspired by the aftermath of Katrina's devastation in Mississippi and Louisiana , this song celebrates the resiliency of the human spirit and the can-do attitude of people who are not waiting on government handouts that will never come. On a personal note, I appreciate that Keith did not ignore Mississippi to focus on " New Orleans " like so many artists and news agencies have done. With a choral throwback to the Stones and a na-na chorus reminiscent of Bon Jovi, "God Made Woman" defies the stereotypes of country. The vocals perfectly express the awe and bewilderment of a man adoring a magnificent woman. Again, Keith shows off his skills as a phenomenal guitarist with an extensive solo. "Tu Compania" has the free-for-all feel of a jam session and a unique funky sound you won't find on the radio. If the vocals for "I Told You So" are perfect, then the vocals for "Tu Compania" are perfectly flawed, expressive, and raw. This may be one of those songs that is never a single and never played live, even if it should be. It is a little gem that many artists might relegate to a b-side if not confident enough to show such a different side to themselves. Here is the obligatory ballad that teams Keith with his former songwriting partner Richard Marx (Better Life). "Everybody" certainly has the potential to be a hit. It's cliché enough to appeal to any regular Joe and is much better vocally and musically than most other by-the-numbers songs on radio. Run, run, run from this song. "Got It Right This Time" is a misnomer if ever there was one. It is bad; not bad as in "It doesn't match the quality of the rest of the CD" bad , but bad as in "What were you thinking?" bad . Reliant on a keyboard and drum machine, it sounds like a demo from the late 70's or early 80's. Keith should have given this one to Tim McGraw because it would make a perfect addition to the festering, ever-growing stinkpile of sappy Tim McGraw ballads that are inescapable for listeners of country radio. There's no bonus track, so just remove the CD from your player after "Everybody" and pretend this one doesn't exist. At least the placement is convenient. Fans of country music, melodic rock, and great guitarists should buy this CD. Genre boundaries are blurred, crossed, and ignored. On rare occasions, truly talented artists have the success that their skills merit. Keith Urban is one of those rare individuals who actually deserves to be at the pinnacle of the music mountain. Love, Pain, & the whole crazy thing will make the listener privy to the evolution of one of today's brightest stars. When you hear an album this good, it only makes you wonder what's next on the creative path.